I posted this in the equipment forum and got no replies so i am trying again here. I have seen two designs on the return line from the column(s) (whisky column, vodka column or gin basket, or quite commonly these drain into a common return line) back to the pot. In one of the designs the return enters the pot above the liquid line in the vapor zone. 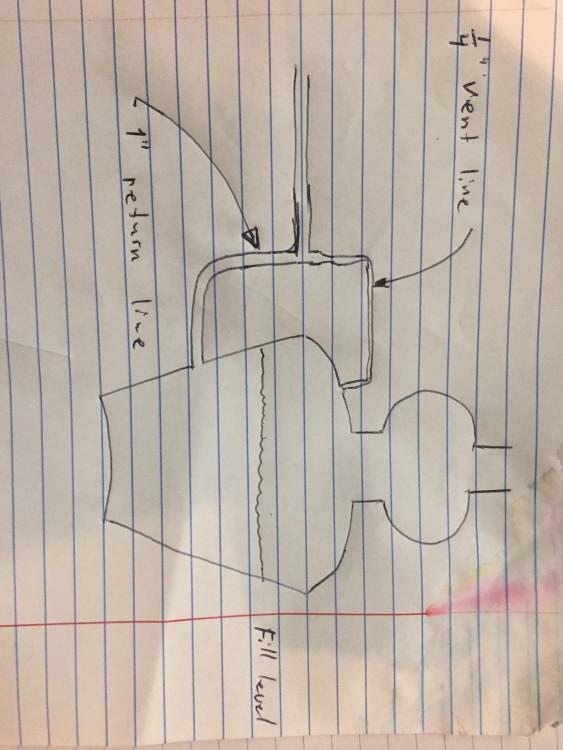 I have heard by the people that promoted this design that it has to be that way or the still becomes vapor locked and floods if the return is under the liquid line and to never fill the still above the return line entrance point. On the other end I have heard that if the return line is above the liquid line vapor will enter the return line and "fight" the returning liquid. Interested in operating and engineering opinions, pros and cons with both designs. It is very important that vapor be prevented from going up the return line. As you said, the vapor will "fight" with the liquid because they are going in different directions. The way to stop the vapor going back up the return line is to install a liquid seal. This seal can either be inside the pot (by having the return line extend to below the liquid surface) or external to the pot by installing a U or P, but not an S, trap. I have seen vapor locking occur with an internal seal, ie one that enters the pot above the liquid level but extends down below the surface. This is because it is quite tricky to get the sizing of the line just right to be able to flush any incondensible gases down the seal leg. However, this is easily fixed by drilling a small hole (approx 1/8") in the elbow inside the pot above the liquid level. This is big enough to allow the small quantity of trapped gases to escape into the pot, but small enough to limit vapors from the pot entering the return line and causing problems. The problem is not that the return line discharges above the level in the pot. The problem is that there is nothing to stop the vapors flowing up the return line. If the discharge is above the liquid level then there must be an external liquid seal in the return line to block the vapors. There are pro's and con's for internal and external liquid seals, but both can work perfectly well. A similar situation exists with the downcomer on a bubble cap tray. If the lower end of the downcomer does not have a liquid seal - either with an inverted cap or by extending the downcomer to below the liquid level on the tray below, then the vapor will flow up the downcomer rather than through the bubble caps. I haven't done it this way, but that is not to say you can't make it work. It seems unnecessarily complicated and I always prefer the KISS approach. Hopefully you will get a comment from someone who has tried it. Our return line is internal below the liquid level. We never experience any backup into the bottom of our column due to slow flow. Ours is below as well. It originally had a piece of pipe that returned it to mere inches from the bottom the kettle. With thick rye mashes we would get some backing up, so we shortened the pipe by about a foot, so it still goes well down into the liquid, but we haven't had the problem since. I understand your nervousness. Do not drill anywhere into the pressure envelope (i.e kettle shell or nozzles protruding outside the kettle), but the pipe inside the kettle is quite safe to drill. I do not own a still so I cannot say I have done it to mine, but I have done similar things when consulting to others. Hopefully some real still owners can confirm that they have done this and it worked. There are two reasons why vapor could be making its way back to the kettle. The first is that there will be air in the column and return piping at start-up, and some of this this will be pushed back to the kettle by the draining liquid - the rest goes out via the condenser. The second reason is that if the drain outlet from the base of the column is not flooded, vapor can enter this line. This would be alcohol and water vapor and will condense with time, depending on the pipe sizes, flow rates and thermal insulation. Of course any air that is trapped never condenses and has to be flushed somehow. The hole in the elbow deals with both situations. @kleclerc77 The first rule of engineering: if it ain't broke, don't fix it. Don't drill holes if they are not needed. In my opinion, all gravity lines should be sloped. Many are not, but still operate successfully. Invoking rule 1 once more - if flow in a horizontal pipe is adequate, don't change it (but I am glad to hear that yours are sloped!). If the lines are big enough and sufficiently sloped then the vapor can rise against the flow of liquid and escape via the condenser. This could be why you do not experience the vapor locks that others have reported, and why you can leave the drill in the cupboard for now. Concerning return lines. They can be tricky, also the bases of the columns must be far enough above the liquid level in the pot so that the pressure created in the pot by the water column in the bubble plates is overcome by gravity. I have seen some manufacturers such as Corson have the column bases to low which causes their columns to flood. As far as return lines: if the return line comes in above the liquid level, vapor will push in and the column will flood unless a J tube is used. The return line must be below the liquid level to form a dip tube if a J tube is not used. Also the return lines should not be to large or column flooding will occur. Also there should be a P trap in the return line before it enters the pot. I have seen some manufacturers such as Corson have the column bases to low which causes their columns to flood. A few people have received equipment from them but sometimes it was not complete and many times when it was complete, it did not work.